At the end of 18th century, the Spanish technically owned Louisiana, the huge region west of the Mississippi that had once been claimed by France and named for its monarch, King Louis XIV. Despite Spanish ownership, American settlers in search of new land were already threatening to overrun the territory by the early 19th century. Recognizing it could not effectively maintain control of the region, Spain ceded Louisiana back to France in 1801, sparking intense anxieties in Washington, D.C. Under the leadership of Napoleon Bonaparte, France had become the most powerful nation in Europe, and unlike Spain, it had the military power and the ambition to establish a strong colony in Louisiana and keep out the Americans. Realizing that it was essential that the U.S. at least maintain control of the mouth of the all-important Mississippi River, early in 1803 President Thomas Jefferson sent James Monroe to join the French foreign minister, Robert Livingston, in France to see if Napoleon might be persuaded to sell New Orleans and West Florida to the U.S. By that spring, the European situation had changed radically. Napoleon, who had previously envisioned creating a mighty new French empire in America, was now facing war with Great Britain. 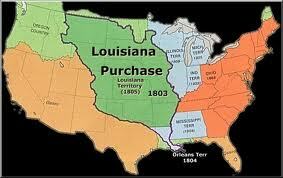 Rather than risk the strong possibility that Great Britain would quickly capture Louisiana and leave France with nothing, Napoleon decided to raise money for his war and simultaneously deny his enemy plum territory by offering to sell the entire territory to the U.S. for a mere $15 million. Flabbergasted, Monroe and Livingston decided that they couldn’t pass up such a golden opportunity, and they wisely overstepped the powers delegated to them and accepted Napoleon’s offer. Despite his misgivings about the constitutionality of the purchase (the Constitution made no provision for the addition of territory by treaty), Jefferson finally agreed to send the treaty to the U.S. Senate for ratification, noting privately, “The less we say about constitutional difficulties the better.” Despite his concerns, the treaty was ratified and the Louisiana Purchase now ranks as the greatest achievement of Jefferson’s presidency.